The Greatest Shop On the PLanet! As voted on by us, the dogs and a few other people! Silver Star Ski & Sport opened in December 2008. We started as more of an amenity to the new Silver Star development but quickly became the go to ski & bike shop for many locals and many visitors. We specialize in service. The customer comes first and the only thing we can control is how we treat our customers. Quite frankly, you can get skis or bikes or whatever many places but we think you will have a better experience when you start your trip with us! We carry high-end rentals and demos for all ages and all seasons and reasonable prices. We carry a full line of apparel and accessories for all the sports we promote and also offer full tuning and repair service for skiing, snowboarding, biking and golf. All of us love the mountains and the activities available here in Park City. We all are avid skiers, boarders, cyclists and anything outdoors! In fact, employees in the winter get paid ski breaks and in the summer are given incentives to ride their bikes both as commuting and on their free time! This is part of the reason we are the greatest shop on the planet! Although we are smaller than some of the other shops in town, we strive to carry and provide our customers with the best brands in the outdoor industry. Below is some of the brands we carry for apparel and accessories. Call us for any specific product questions as we cannot list everything we carry. Not only do we have some of the best name brands in the outdoor industry, we also carry logo t-shirts, hats and other gift items. Check out our online store for most of those items! If you need something outside of these hours, let us know! We can try to accommodate if your flight gets in late or want to get moving earlier. We do adjust hours in the beginning of summer and after Labor day. Call us for specifics if you are coming before June 15th or after September 5th or so. If we are here - OPEN! If we are gone - CLOSED! Give us a call if you need something! We are generally around in the off season getting ready for the next season! We sell FUN so we try to keep it FUN! We try to keep the environment fun for the customers and the staff! We have great products available and have well trained staff, but the biggest difference is how we treat you! We pride ourselves on taking care of you, the customer, in the best way we know how and that is with service and try to anticipate your needs and wants. We all love the mountains and are here to enjoy them and we want you to experience them the way we do. We are always looking looking for great people to add to the staff, especially in the winter season. If you are interested, send us your resume to info@silverstarskiandsport.com! Azalea - Shop dog in Training - She became a member of the family and team in the summer of 2017. She's learning the ropes quickly and is already a fan favorite. Vidalia can't be replaced but Azalea's already quite the character. Todd Fischer - Owner/Operator - Originally from Palatine, Illinois, Todd has been coming to Park City since 1984 and moved out after college in 1998. 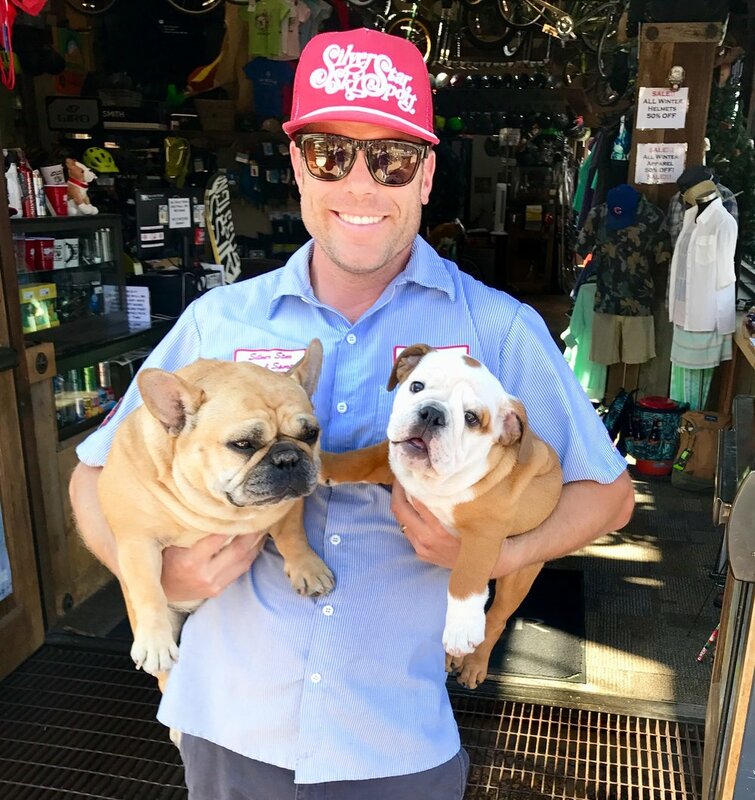 When the opportunity presented itself, he opened Silver Star Ski & Sport in 2008 and has been sharing his love for the mountains with customers ever since. Kate Fischer - Co-Owner/ Todd's better half -. Originally from the great state of Alabama...WAR EAGLE!, Kate has lived in Park City since 2002. She is not always in the shop as she focuses on real estate (hit her up for any real estate inquiries at 435-513-5015! ), but she definitely keeps the crew in check, especially Todd! Melissa - Sales Associate - Melissa has been with Silver Star Ski & Sport since fall of 2013. Her and her husband hail from Tennessee but their love for the mountains called them out west. Her southern charm is infectious! Alex -Rental Technician - Alex decided one day while working at Ford to take a coffee break. On that beak, he hopped in his car and just kept driving till he arrived in Park City. Justin - Rental Technician - Justin hails from Idaho and has spent most of his time in Park City as a member of Ski Patrol. He decided to make a change and work indoors this winter! Matt - Rental Technician - Matt has been at the shop since fall 2014 and is from the Boston area. He has lived in Park City for 15 years but hasn't lost that accent! Seth - Rental Technician - Seth has been with the shop since fall 2014. He is originally from New Hampshire and is the best snowboarder in the shop, maybe even the best in the country! Taylor - Rental Technician - Taylor is our FNG and has hit the ground running. Originally from North Carolina, he decided to call Park City home a few years ago! Tripp AKA Snag- Wax guy - His favorite place to shred on the Mountain is Scott’s Bowl! AJ- Wax guy - AJ started coming out to snowboard with his family and loved it so much he convinced them to move to Park City from Florida! Mickey - Rental Technician - Mickey started in the fall of 2011 and has since moved up to Washington state. He loves the shop he still comes and helps out during the busy times around finishing school and slinging real estate! Click on the above review sites and check out what real customers have to say on Google Reviews, Yelp and Tripadvisor! And...if you have any feed back, comments, suggestions, etc., please leave us a review on these sites or fill in the form below! Stay in touch with via Social Media!